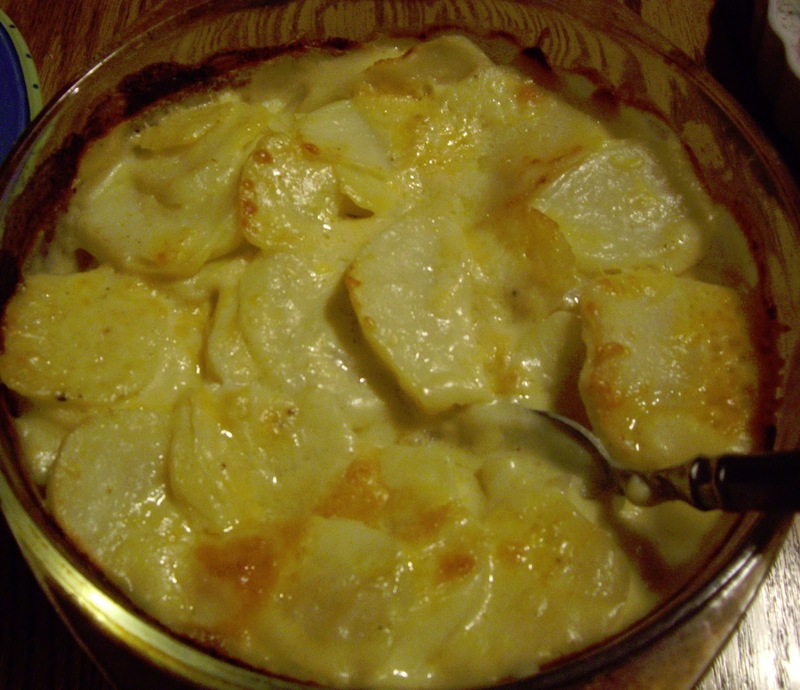 Potatoes and cheese- does it get a lot better than that? In my opinion? No. It’s especially great to warm you up on a really cold day. You will need a 2 quart baking dish with a lid. Peel and slice the potatoes fairly thin. About 1/8″ or a little thicker is good. Put the slices in the baking dish. Add the diced onion and cook til soft, if using. This will take a few minutes. Next add the salt, pepper, and flour. If you didn’t use the onion, but are using the powder, add the powder with the salt, pepper, and flour. Raise heat slightly, continuously stirring until the flour/butter mixture is bubbly. Add the milk and keep stirring until the sauce is bubbly and thickened. Turn the heat off and stir in the cheese until melted. Sprinkle Parmesan cheese over the top of the sauce. Cover with a lid and put in the preheated oven. After 45 minutes, check the potatoes, by poking with a fork. If they are tender, the dish is done. If they seem a little solid, cook for another 15 minutes and test again. The thicker the potatoes are sliced, the longer they take to cook.